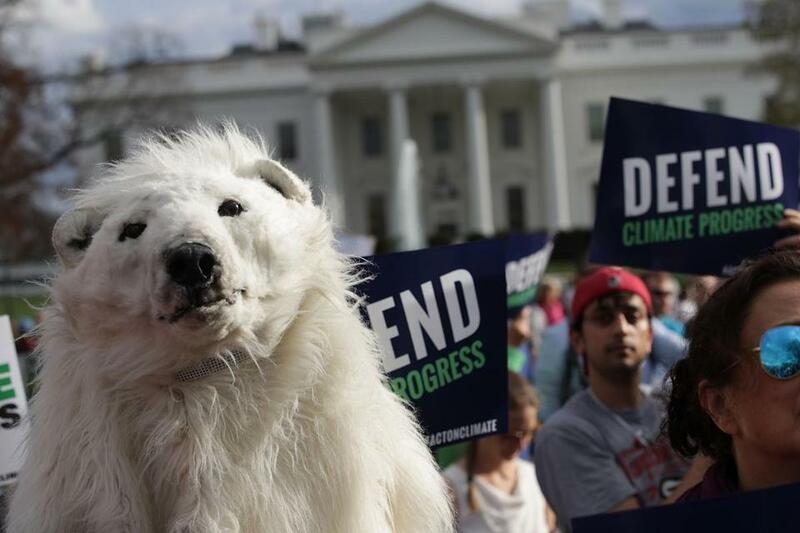 An environmental activist wears a polar bear costume during a protest outside the White House against President Trump’s executive order rolling back President Obama’s rules regulating fossil fuel power plants and cutting greenhouse gas. Our country is feeling the effects of a changing climate. The West is witnessing dramatic changes to winter, including decreased snowpack — which means less water availability the rest of the year — and tremendous destruction of Western forests by bark beetles that used to die off in winter, but now don’t. Here in Massachusetts, people might think that shorter, milder winters are a good thing. But they are not. If we don’t deal with climate change now, the snowpack will be confined to only the highest of elevations. Of course, renewable energy is helping to stop further climate change. But solar and wind have trouble competing with fossil fuels, because it’s just not a fair market. Fossil fuels — whose greenhouse gas emissions drive climate change — are more widely available than clean energy, and they are usually cheaper, due to ongoing subsidies. A carbon pricing system would level the playing field. Putting a price on carbon is a proven market mechanism that has widespread, bipartisan support, and is increasingly being adopted around the globe. It will account for the true cost of burning fossil fuels, creating a more competitive market for clean energy sources. And, it can be implemented quickly to begin reducing carbon pollution. In Massachusetts, there are two carbon pricing bills pending in the Legislature, with co-sponsorship of more than one-third of our lawmakers. These proposals focus on putting a price on fossil fuels once they enter the state and distributing revenue collected back to businesses and households in the form of rebates. One proposal returns 100 percent of the revenue collected; the other returns 80 percent of revenue while reinvesting the remaining 20 percent into a Green Infrastructure Fund, funding energy efficiency, climate resilience and adaptation measures, and public transportation. Either one would be a great step in the right direction. Each year, Massachusetts spends around $20 billion to import the very fossil fuels that are damaging our climate. Carbon pricing legislation will encourage a shift to clean energy and keep more of that money here in our state, where it can strengthen our local economy. Given the Trump administration’s daily rollbacks of climate policy, our state has the opportunity to lead the fight against climate change. By adopting carbon pricing, we could level the playing field, build a 21st century energy economy, and prevent further damaging climate change. Naomi Oreskes is professor of the history of science at Harvard University and a board member of Protect Our Winters. Jeremy Jones is a native of Cape Cod and founder of Jones Snowboards and Protect Our Winters.